This yantra in numeric pattern helps pacify pitra (departed ancestors) dosh and appease them for their blessings . 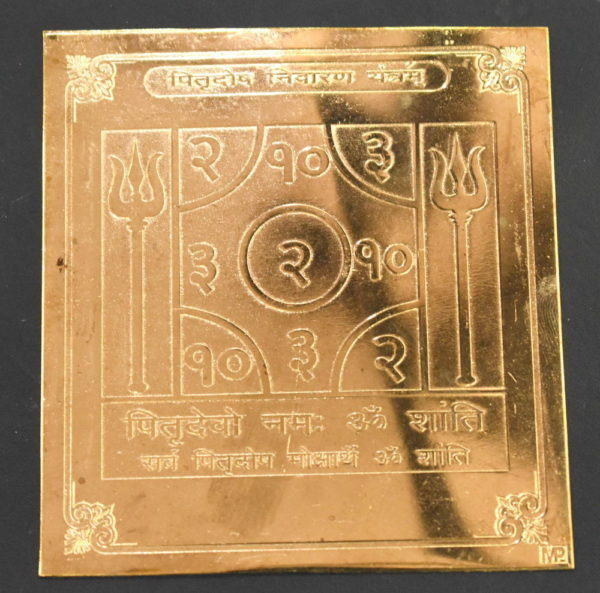 Pitru dosh is considered to be cause due to unhappiness and unrest of one’s departed ancestors . Pitra dosh causes household conflicts , health issues , difficulties in carrer or progency or law suits , financial loss or debts . Regular worshipping this yantra with sincere devotion helps break the cycle of suffering cause due to pitra dosha and bring happiness and harmony and peace of mind . Relief from mental and physical ailments . Helps remove difficulties in carrer and finance . Bestows progency , fortune , harmony and peace of mind .